*Unregistered Original Disc and Serial for 2 installs. You will be entitled to full support and updates from the manufacturer. Simplify everyday tasks with Adobe Acrobat XI Standard software. Easily create and share PDF files that can be viewed reliably on computers, tablets, and smartphones. 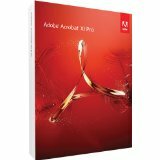 Edit PDF files intuitively within Acrobat or convert them to Microsoft Word or Excel formats. Electronically sign documents yourself or get them signed by others. Convert PDF to Microsoft Word or Excel and preserve formatting. Preview and arrange multiple documents before combining them into a single PDF file. Easily sign documents yourself or get them signed by others.